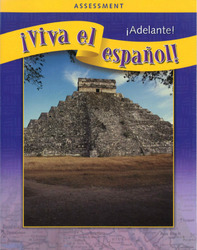 The Assessment for ¡Hola!, ¿Qué tal?, and ¡Adelante! is made up of a blackline master book of tests and an Assessment CD. The blackline master book contains all the tests you will need throughout the school year as well as a student progress chart, a complete discussion of strategies for assessing and evaluating students’ abilities and an answer key. Recorded on the Assessment Audio CD are listening comprehension activities that correspond to the Assessment.